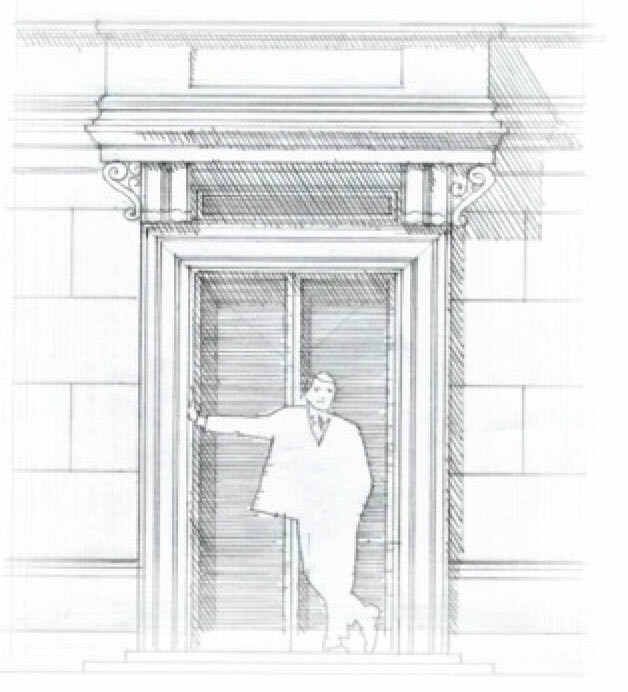 A study of the elegant and time-honored building details found in classical European architecture reveals a careful attention to mathematical proportions. 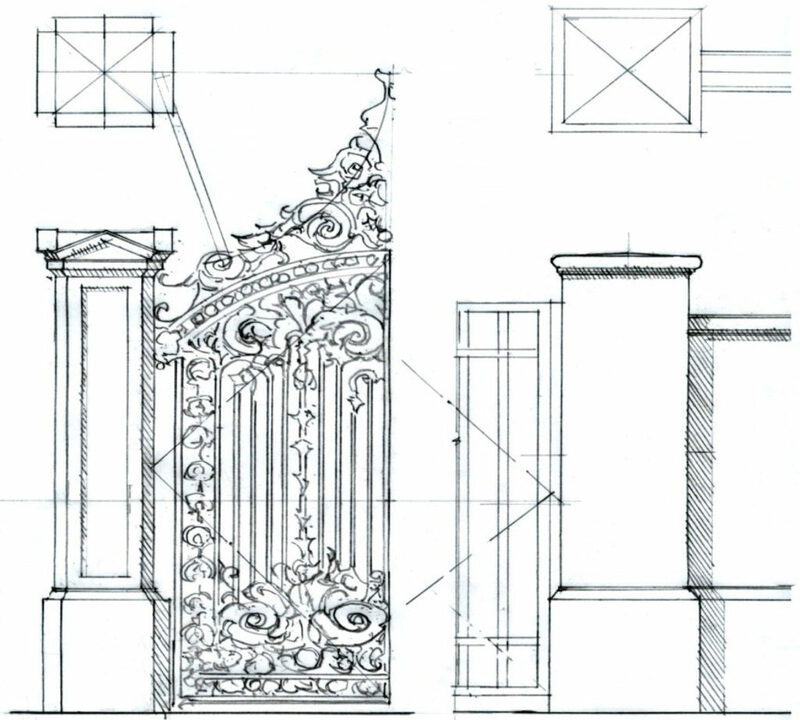 Because of the significant expense required to adorn modern buildings with materials of appropriate scale and detail, such masterful craftsmanship has all but disappeared from modern design. 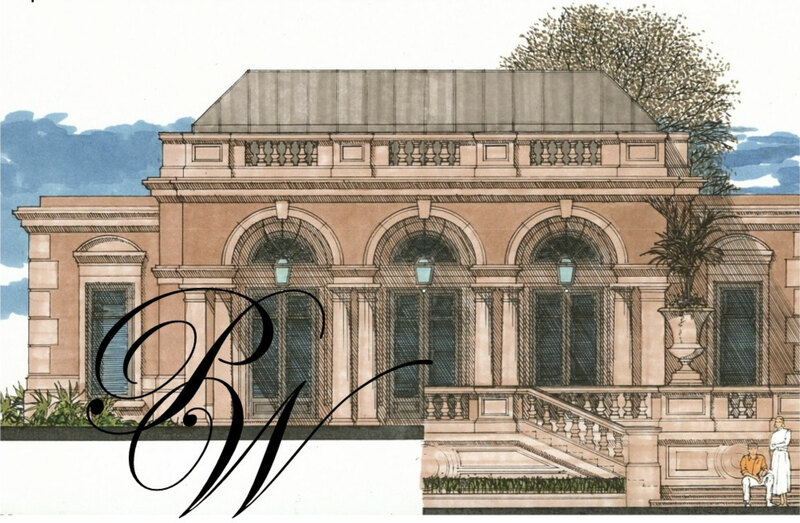 PW’s technologies, however, now make such architectural sophistication a practical and affordable alternative for the modern builder. 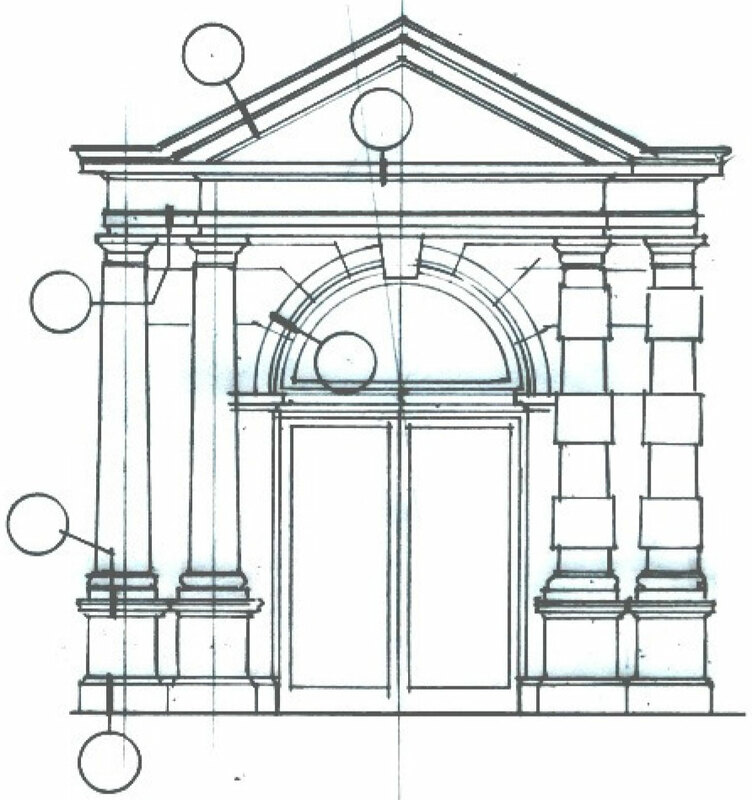 Before beginning the profile selection process and creatively desingin your project, it may be valuable to take a few moments to examine the above illustrated example of classical Palladian architecture. 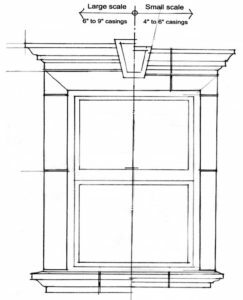 You will note that this structure not only has significant door and window surrounds, but includes base, mid-band and cornice details of even larger scale. 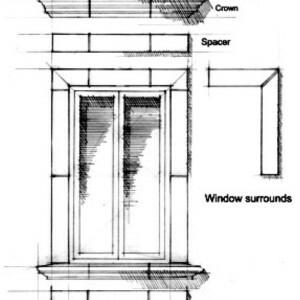 The columns, corner quoins and balustrade walls are also quite substantial, thus helping to complete an overall image of strength, solidity and architectural grace. 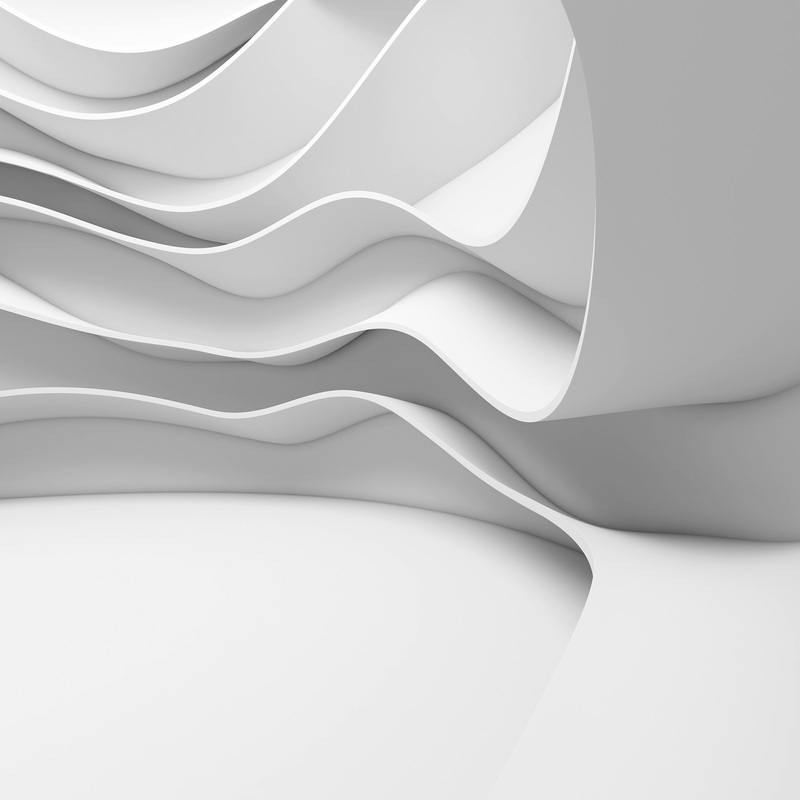 The following images will address some of these key design components and offer suggestions that we hope will help you develop your own elegant project detailing. 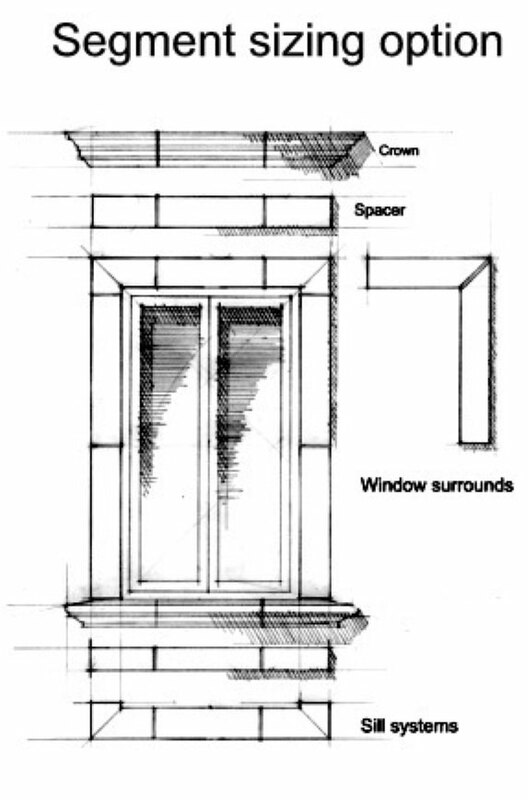 Stanndard windows on a typical modern home are generally enhanced with PW casings 4”-6” in width, with sills of similar proportion. 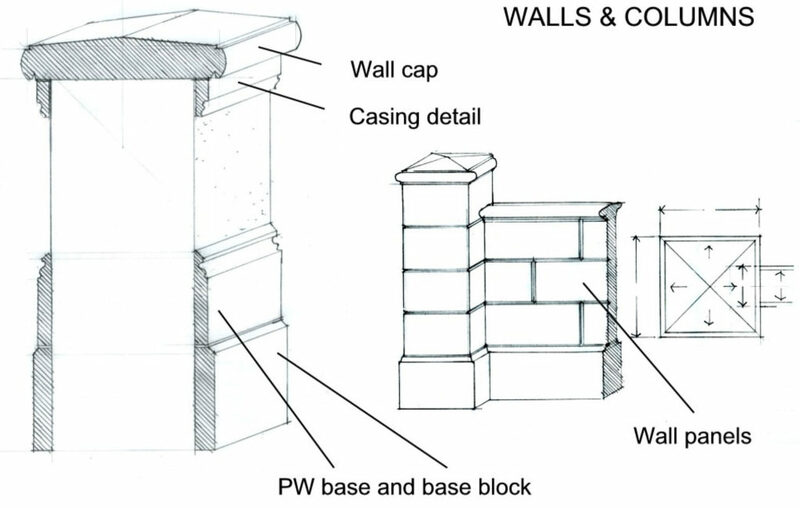 Larger-scale homes, feature windows and doors, and key passageway opennings typically benefit by using PW casings 6”-9” in width, or even larger for more massive structres. 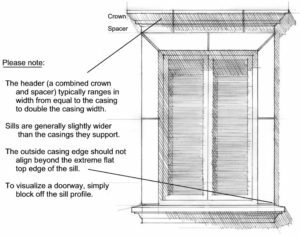 PW sills and headers are available to complement any degree of casing upsizing. 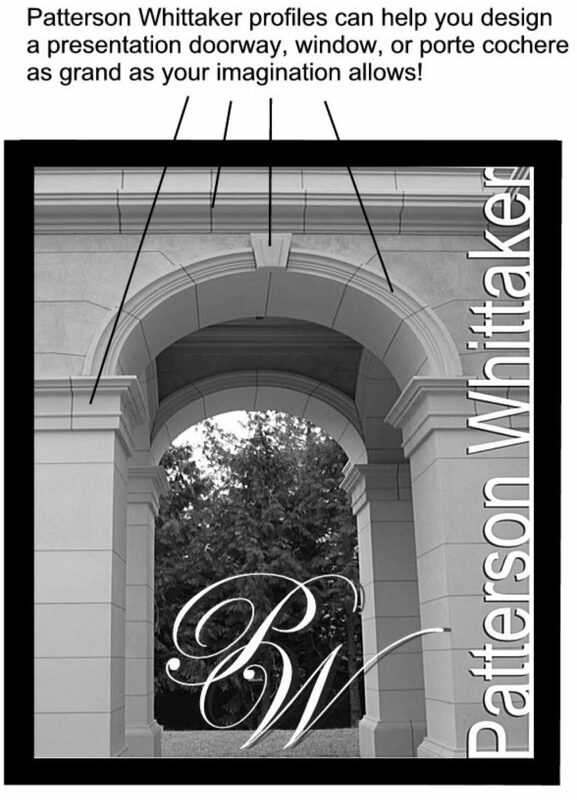 For an even more elegant appearance, PW headers, corbels, keystones and arch tops might also be worth of your design consideration. REMEMBER. 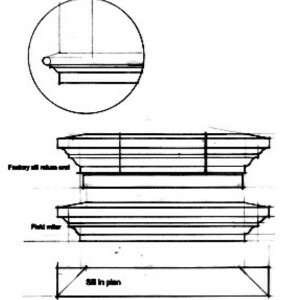 Each PW shape is elegantly designed, but careful attention should be made to ensure each component of the overall assembly is in proportion to the whole. 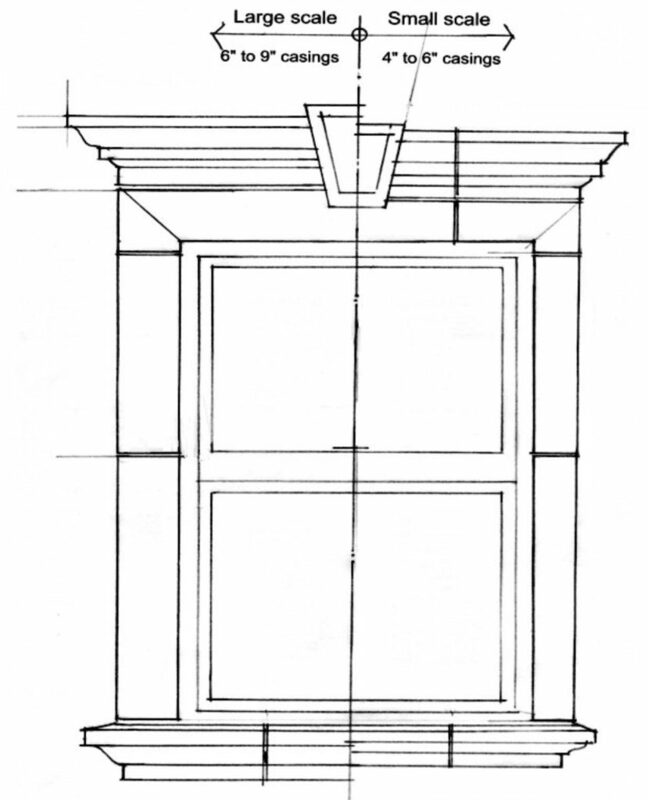 The same guidline should be followed when adding bases, mid-bands, cornices and other features. 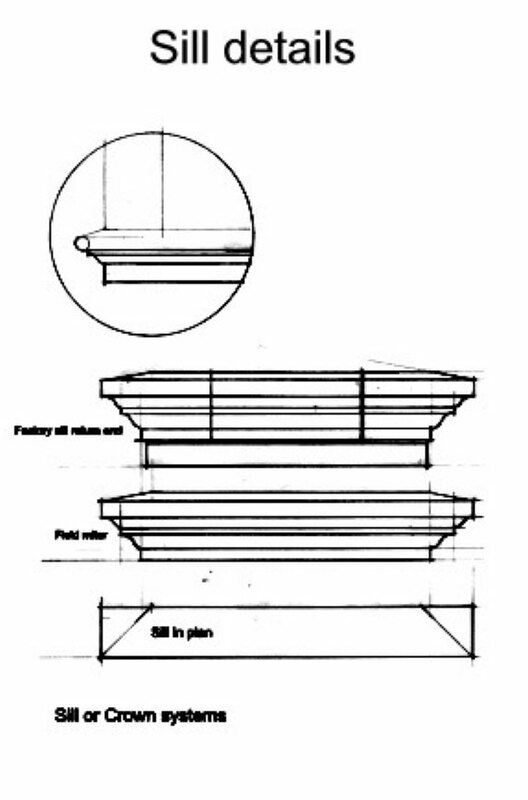 The header (a combined crown and spacer) typically ranges in width from equal to the casing to double the casing width. 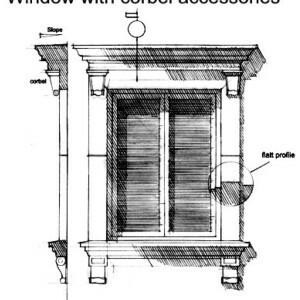 Sills are generally slightly wider than the casings they support. 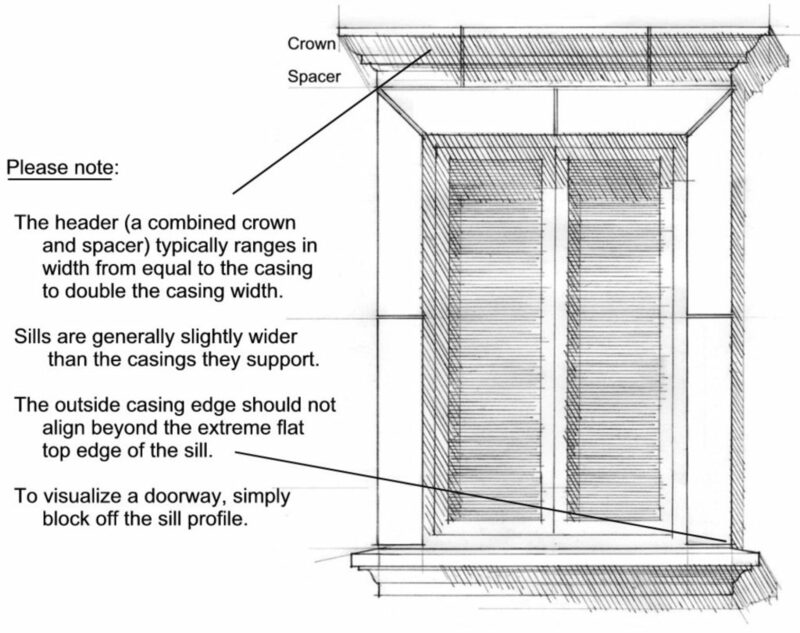 The outside casing edge should not align beyond the extreme flat top edge of the sill. 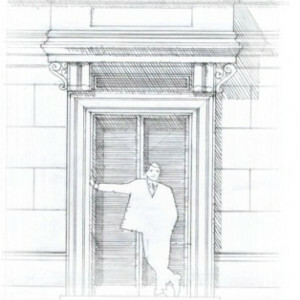 To visualize a doorway, simply block of the sill profile. As a general rule, Patterson Whittaker profiles provide larger scale, finer detailing, and better design engineering for rain slope and drip edging than conventional trim materials. 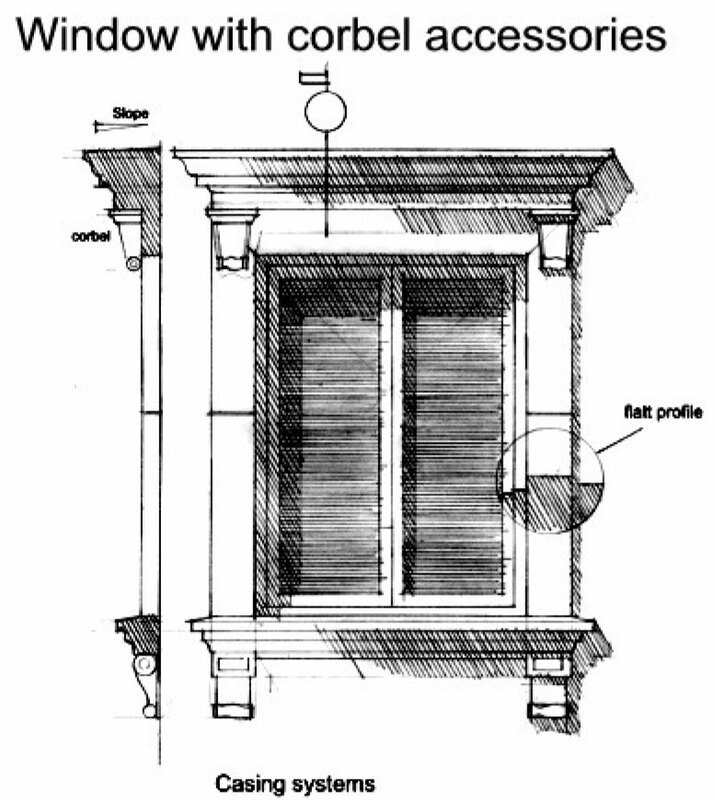 Out catalog shapes and decorative accessory details are scaled to work in a graceful, mathematical relationship with each other and still provide a functional assembly that helps naturally shed rainwater from the building face. 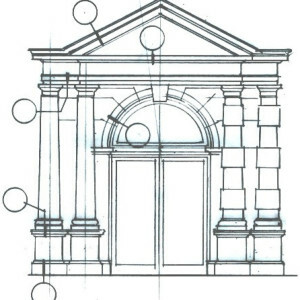 A classical arch is a true ½ circle. 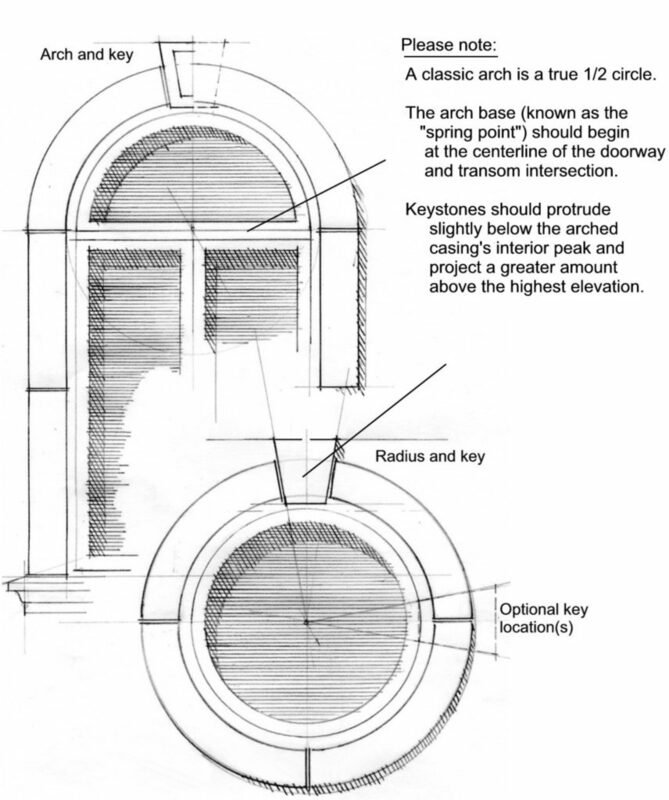 The arch base (known as the “spring point”) should begin at the centerline of the doorway and transom intersection. 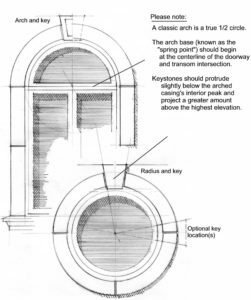 Keystones should protrude slightly below the arched casing’s interior peak and project a greater amount above the highest elevation. 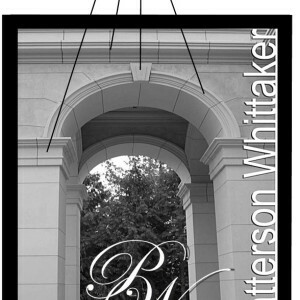 Patterson Whittaker profiles can help you design a presentation doorway, window, or porte, cochere as grand as your imagination allows.